“If you moved to Norway or Haiti or Bolivia, you'd notice something immediately: People don't move at the same speed you do. The same thing is true about different organizations and different pockets of the internet. Or months of the year, for that matter. There's not an absolute speed, a correct velocity, a posted limit or minimum for all of us. It's relative. Given that, how does your speed match your goals and your strategy? Not compared to everyone else, but compared to the one and only thing you have control over? Passing the slow cars on the road is an illusion, a chance to fool yourself into thinking you're making good progress. To a sloth, even a loris is a speedster. As I sometimes do in my off hours of work, it got me thinking about some of our lawn maintenance customers. How does this post on speed relate to them? There were a few points that he made that really stood out to me. 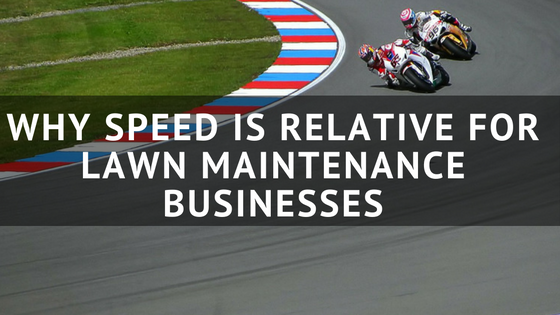 Not everyone on your lawn maintenance crews will work as quickly as your fastest guy. And your fastest guy might not be your best crew member, either. What can you do about that? Well people have physical limitations. Likewise, there is only so fast you can go(safely) on a big ZTR and still be effective. There is a limit to how fast anyone can mow a lawn, trim and edge, but that doesn’t mean that you need to be redlining it consistently. Godin makes this point - “There's not an absolute speed, a correct velocity, a posted limit or minimum for all of us. It's relative”. How does your speed match your goals and your strategy? Are you mowing fast for the sake of getting in and out of a customer’s property? Are you trying to get as many lawns in in a day as possible? That might be fine, but does that align with your business strategy? If you position yourself as a cost leader in the market and you need to be the quickest in order to hit your margins, great! Your customers should know what they’re getting themselves into if they’re paying much less than it’d cost to go with another provider. But if you’re business goal is to be the premier lawn maintenance provider in the area based on quality, flying through a yard at Mach 1 on your Toro or Husqvarna might not align with your professional aspirations. For that reason, match your speed to your goals. Speed is relative to your market. Know your competitors and the type of work that they perform, but also be aware of your speed. Lawn maintenance businesses make more money when they’re able to beat the estimated time they built into their estimates. But if you’re constantly racing to hit those marks, are you even estimating correctly? While one company might be able to mow a customer’s lawn for a lower price, they might not be providing the quality of service that you provide. And that is ok. You don’t need to win every bid, because as Godin puts it in another blog post, the race to the bottom is unforgiving and relentless. Want to know your numbers? Learn how FieldCentral can help your lawn maintenance business.